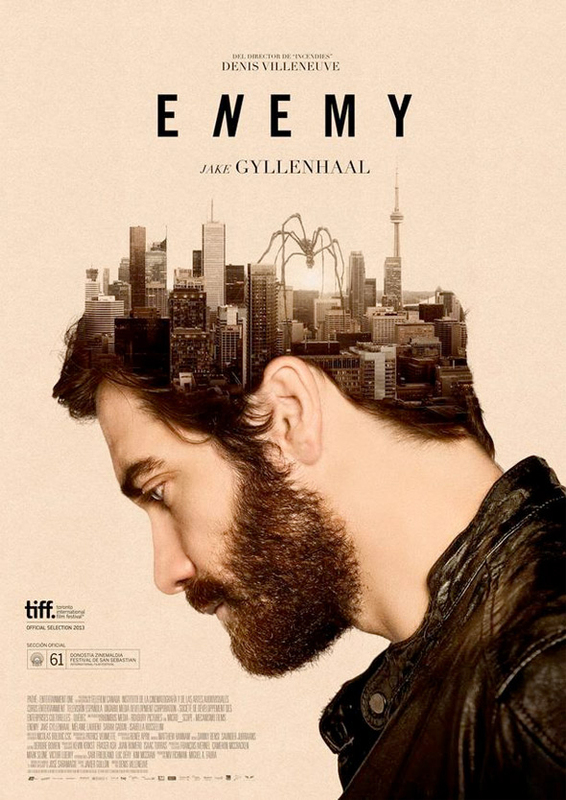 Denis Villeneuve, the director behind the much acclaimed Prisoners (2013) and Incendies (2010) takes a stranger, more macabre turn with this latest psychological thriller-mystery Enemy. The film is adapted from a novel titled The Double by José Saramago, and takes an intriguing look into the subject of dueling masculine identities among other things. Adam (Jake Gyllenhaal) is an undistinguished college professor who lives with his girlfriend Mary (Mélanie Laurent) in an apartment that can only be described as bland. In fact, the palate of this film can be described as a washcloth with all the color rung out. It’s not a bad thing, but this film is not subtle about it. Adam is so monotonous that a simple conversation about movies with a coworker turns tedious, but still results in Adam getting a recommendation. As he watches the film, Adam notices a bellhop in the background that looks exactly like him. Adam researches further and finds the website of the actor, Anthony St. Claire (Jake Gyllenhaal), and even finds his wife Helen (Sarah Gadon) who is a pretty convincing match for Mary. As one might expect, Adam becomes obsessed with locating his doppelgänger, and solving the mystery behind their mutual existence. The setup to Enemy is what makes this film. The deeper Adam gets into finding Anthony and reconciling their resemblance, the more I pondered where screenwriter Javier Gullon would take this story. Part of the fun of watching mysteries is thinking you’re smarter than the filmmakers, only to find out they are playing you. But inevitably, the climax of this film is a slight letdown given the ingenuity of what comes before. At its core, this film is about the exploration of psychological neuroses and cultural pressure on masculine ideals. Adam is a version of a man that lacks fulfillment in every area of his life but has neither the ability or the desire to change it. On the surface, he is what we would call a “nice guy.” Anthony on the other hand, has the confidence and swagger that on the surface looks appealing but is really just hiding a deviant layer underneath the skin. Instead of coexisting as one, these two images of manhood are in a constant battle with each other for supremacy. There’s a lot more to it, but at the risk of divulging too much, I’ll leave it at that. I can’t think of a better actor than Jake Gyllenhaal for the dual role of Adam and Anthony. He’s proven in the past he can play the sensitive, wishy-washy type that works for Adam, but he really brings a nuanced performance for Anthony, with just the right amount of douche and protein shake pretentiousness to be recognizable but not over the top. This is not a black and white, good vs. evil showdown between different versions of the same man, though it could easily have gone that way. Gyllenhaal manages to create two very distinct characters that both possess desirable qualities which makes their struggle and the film itself more interesting to behold. Enemy‘s primary focus is not on delivering a satisfying conclusion (or a clear one for that matter), but rather a discussion on what it means to be a man in today’s society. On that level, it succeeds, and if audiences spend the time concentrating on the rich imagery, rather than the plot, there is something to take away from the experience. Enemy opens today at the Roxy Theater.